The body diverts blood flow from the surface as the temperature drops so the most important parts stay warm the longest. This allows the body's core to be protected for longer. If blood flow is gone from the extremities for too long, the cells start to die. Depending on the severity of the damage, new cells will either replace the old or that part of the body is lost to frost bite. 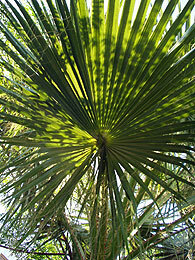 Humans are essentially tropical animals and are not equipped to deal with even mild cold. That we can live in cold climates is a result of behavioural adaptations such as wearing appropriate clothing and building shelters. Successfully surviving cold requires two simultaneous events. Firstly, generating sufficient body heat by burning food and secondly, preventing the loss of that heat by suitable clothing and shelter. The lowest temperature that can be endured is a combination of the duration and the extent of the exposure, so it is not easily determined. 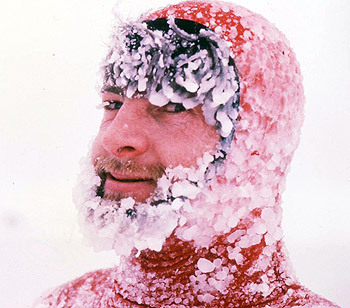 A naked person will start to feel cold if the surrounding temperature drops below around 25°C (77°F). Physiological responses such as shivering and diverting blood away from the extremities and surface of the skin will then kick in. These physiological responses mean that a reasonably well nourished adult can maintain their core temperature in still air just above freezing point wearing only light clothing, though they will feel cold and shivery. Normal human body core temperature is 37°C, 38°C is a fever making you feel very uncomfortable and 40°C is life-threatening requiring immediate medical intervention. Below normal temperature, at 36°C you will start to shiver and feel very cold, by 35°C the cold feeling is very intense, the skin may feel numb and have a blue/grey tinge as a result of diverted blood flow. The range of body core temperatures we can function properly within is very narrow. Perhaps the most surprising thing is that most people go their entire lives of many decades without once leaving the normal zone by more than a couple of degrees either way. This maintenance of temperature becomes much more difficult in moving air and also in damp or wet conditions. 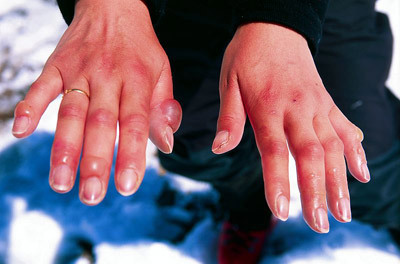 If the extremities fall below freezing point, even if only barely, then frostbite and possible permanent damage will occur. The cooling effect of moving air is well known, the phrase "wind chill factor" was coined by the American Paul Siple to describe the fact that wind increases the rate of heat loss and has the effect of making it seem as though it's really colder than the thermometer is showing. 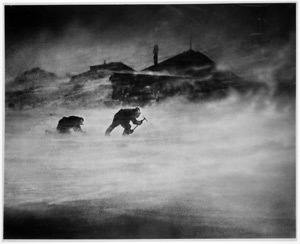 Siple's original experiments were conducted in Antarctica in 1941 by measuring how long it took water to freeze in baked beans tins in different strengths of wind and at different temperatures. The use of wind chill is to show the effective temperature at a particular wind speed. For instance in calm conditions at -29°C a well clothed person is in little danger, if we add to this temperature, a light wind of 10mph, this will then give the same effect as a still air temperature of -44°C when exposed flesh can freeze in a minute or so. Increasing the wind to a breeze of 25mph gives an equivalent of -66°C with severe danger to exposed flesh within seconds rather than minutes. This is one of the reasons why Antarctica is such an extreme environment, it is often both very cold and very windy. A reduction in body temperature results in impaired body function. This is seen most easily at low temperatures when you try to do something like tie a shoe-lace or do up an awkward button with fingers that are clumsy with cold. The nerve cells that transmit impulses work more slowly as do the muscles controlling your fingers. 12°C is the critical air temperature for good manual dexterity and 8°C for touch sensitivity. In Antarctica, I was most aware of this when axing through sea-ice to make a hole for a diver (to set fishing nets). After five minutes or so of chopping away I had to prise my fingers of one hand individually away from the axe handle using a very clumsy other hand as the cold had slowed the blood flow, the effect made worse by gripping it so tightly, this despite wearing gloves. Low temperatures also reduce the efficiency of pain receptors, so putting an ice pack on a burn or sprain helps to reduce swelling and damage, but also helps with the pain. A common symptom of cold weather is its effect on urine production. Exposure to cold causes a reduction in blood flow to the surface of the skin by constriction of blood vessels. This reduces the overall volume of the circulatory system so increasing the blood pressure. The body's response to this is to reduce the fluid volume by getting rid of some water via urine, an event known as "cold diuresis". When you get cold, you want to pee. 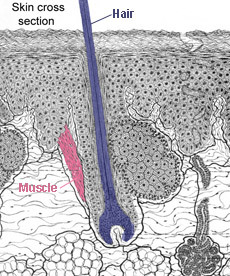 Another reaction you may notice is that when the skin temperature falls below about 10°C, the surface blood vessels dilate (get wider) rather than constrict, If the temperature falls further periods of blood vessel dilation alternate with periods of constriction, This is because your body is trying not to lose heat from the extremities, but at the same time wants to supply the skin with blood for oxygen and nutrients. This phenomenon explains the red cheeks and nose characteristic of frosty weather. Eventually however the body stops the dilation of the blood vessels to the skin and the skin falls to the surrounding temperatures when frost nip or frost bite may occur. Goose bumps or pimples are an obvious sign that a person is feeling cold. They are caused by an individual tiny erector pili muscle attached to the base of each and every hair follicle covering the body. The scientific name for this is horripilation. In man it has no effect as we don't have enough hairs to make a difference, but in animals with a dense coat of fur it improves the insulation considerably, you may notice your cat or dog becomes noticeably larger outdoors when it gets below freezing for instance. A final response to decreasing temperature is the increase of heat production. Muscular contraction is an inefficient process and causes much heat to be produced, so when we start to feel cold, we may begin to shiver, movements that are useless in themselves, but that generate heat as a by-product and so help to warm us up. Shivering can increase the production of heat five-fold over resting. In conditions when the body starts to lose more heat than it can easily generate to keep all parts at the normal 37°C it will start to allow the extremities, fingers, toes, ears, nose, and cheeks start to get cooler. There is still a blood flow to these body parts, but not as much flows as does normally. In order to keep the extremities at normal body temperature, greater blood flow would be required which would bring cooled blood back to the body core so cooling the body even further. The extremities have a high surface area/volume ratio, so they lose heat very easily. This reduction of blood flow is not normally a problem and happens to some extent for most people much of the time even in mildly cool conditions. In extreme or prolonged cold however it can lead to frost-nip and even frost-bite. These are situations in which the body has made the decision to risk or sacrifice some of the more expendable regions to preserve the core temperature and so avoid death from hypothermia. The first stage is frost nip. Most often observed at the end of the nose, tops of the ears or possibly fingers. The skin goes an unnatural looking paler, pasty shade and loses sensation. This is caused by a lack of blood flow to those regions because they are losing so much heat. Frost nip is an early warning sign that if left will lead to frostbite. It can be readily corrected however by putting on extra clothing. The skidoo gloves I used in Antarctica had a large patch of sheepskin on the back to hold against and warm up any frost-nipped parts, usually nose or cheeks. The important thing with frost nip is to keep an eye on your companions as it is so easy to miss it on yourself. Frost nip can actually freeze the surface layers of the skin and lead to symptoms like sun burn with the warmed skin later turning bright red and being sloughed off. There is no permanent damage. The next stage is frost bite. Left unattended, frost-nip will lead to frost bite. The difference is that in frost bite, the skin actually falls below freezing point and ice crystals form within the live cells of the skin killing them in the process. On rewarming, the skin swells and blisters turning blue-purple to black - this then forms a hardened black carapace. If the damage is not severe, the dead layer is sloughed off revealing new healthy skin that has grown underneath. It is however very painful. This is known as superficial frost bite. "The temperature was -47°F and I was fool enough to take my hands out of my mitts to haul on the ropes to bring the sledges up. I started away with all ten fingers frostbitten. They did not really come back until we were in our tent for our night meal, and within a few hours there were two or three large blisters, up to an inch long on all of them. For many days those blisters hurt frightfully"
More serious is when frostbite affects the deeper layers of muscle and bone. This almost always results in permanent tissue damage and may result in amputation of fingers, toes, even feet, hands and parts of the arm or leg. 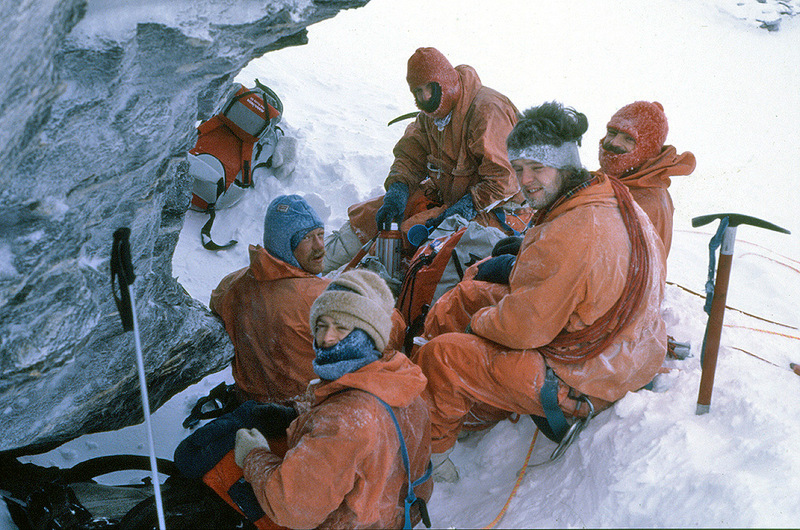 Many polar explorers and mountaineers have lost parts of some fingers or toes because of frostbite. Treating severe frostbite - serious damage can be caused when badly frostbitten body parts are rewarmed, particularly if it is done too rapidly. It is therefore better to keep the parts frozen until medical attention can be received. Cold weather on a modern society has a number of effects, most dramatically on the general population mortality rate. The average mortality on a winter's day is about 15% higher than on a summer's day. Cold weather is directly responsible for deaths through such things as hypothermia, influenza, and pneumonia. It is also an indirect factor in a number of ways such as death and injury from falls, accidents, carbon monoxide poisoning, and house fires all of which are partially attributable to cold. The gender and race of a person are important when it comes to how susceptible they are to direct cold injury and hypothermia. Non-white elderly men are the most at risk, while young white women are the least at risk. Women have a higher gradient of temperature from the skin to the body core (they're more likely to have cold hands for instance) and so it seems are more able to maintain a constant body core temperature in cold conditions. Subcutaneous fat has a part to play as an insulator and women generally have more than do men so helping them stay warm. On the other hand, because of the high temperature gradient from skin to core, women are more likely to suffer from surface cold injury such as frostbite. Age has the highest influence, more so than gender, with elderly people of any race having the least ability to survive cold injury. Studies have shown that shivering and vasoconstriction to reduce blood flow to the body periphery are not so prominent in older people, putting them at greater risk. Also as we get older, we become less able to distinguish changes in temperature and so older people are more likely to start to lose heat early on before it may become a problem. Adaptation plays a major part. Living in a cold environment means that people become used to the temperature and the metabolism changes to adapt. I remember quite vividly, having been in Antarctica for nearly a year, when the supply ship came in on what we considered a balmy day. We winterers were walking around in t-shirts and loose un-tucked over shirt with rolled up sleeves, while those who were new arrivals were well wrapped in fastened jackets and hats and still feeling cold. The two groups surveyed each other with some puzzlement. The old idea of cold showers or baths and "washing in snow" to toughen up against the cold does indeed work. When a cold snap hits a normally warm city, the mortality rate will be significantly higher than the same temperature at a colder city which may show no increase in mortality at all if the cold snap is fairly mild. These cold-related deaths differ from the immediate impact of cold injury in that there is a time lag of about 2-3 days after the period when the cold snap happened. With thanks to Morgan L. Anderson for the summary at the top of this page.